A super easy 3-ingredient good old fashioned dinner. Spoon the cream of mushroom soup over the top of the chicken. Remove lid, shred chicken. 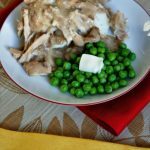 Serve chicken and gravy over rice or mashed potatoes or toast. This was one of those days that I had no idea what to make for dinner. I went to my pantry and found a can of cream of mushroom soup and a thing of onion soup. Bingo. It was also one of those dinners that I knew my husband would appreciate a lot. I was thinking of adding some cream cheese or sour cream at the end but the sauce was perfect and I decided not to add anymore calories. This is a great recipe if you’re feeding a crowd and need something super duper easy and fast! If I use 2lbs of chicken breasts, would I need to cook it for 8 hrs? No keep the cooking time the same. I put this on a bed of white rice! It was amazing!! I only used three large boneless chicken breast but added two cans of cream of mushroom soup. Added a 8oz pkg of fresh sliced mushrooms as well. I cooked it on low for 8 hours and chicken just fell apart like pulled pork. My husband thought the chicken was too mushy and a tad too salty. The consistency was perfect to me, I am glad I added the second can of soup. I served it with stuffing and a veggie. I have to find a way to cut down on the sodium. Perhaps you could use low sodium cream of mushroom soup. I bet that would help a lot! My family loved it!! I used 4 thin boneless chicken breast. My family loves gravy so I used 2 cans of soup one can cream of mushroom and one cream of mushroom/chicken soup, served with mashed potatoes, stuffing and peas..it was a big hit!! I bet you could totally do that. This was easy and delicious! I used boneless chicken breasts & cream of chicken soup, simply because it was what I had on hand. I served it over rice and the gravy was really good. I’m thinking next time I would use 2 cans of soup to have extra gravy! 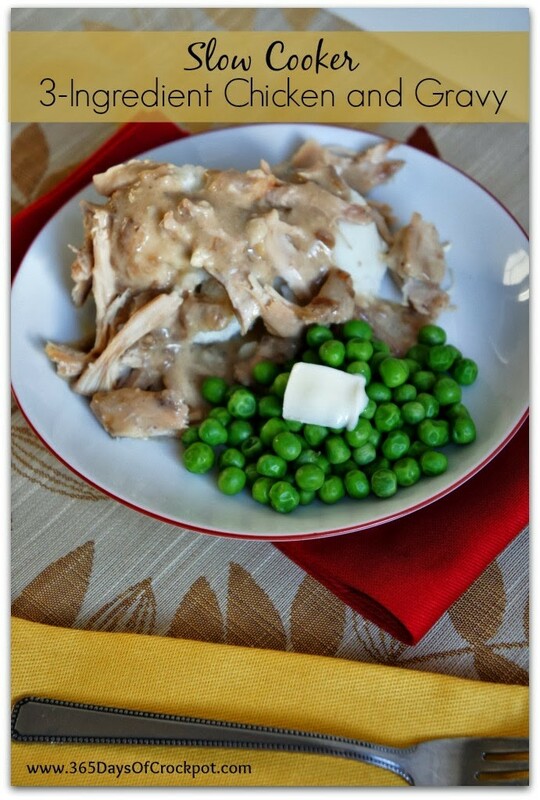 This would be nice served with stove top stuffing & a vegetable like a mini thanksgiving dinner without all the fuss! Thanks for the recipe, I needed a dinner idea at the last minute that was quick and easy this worked well. Thanks Sherry! I’m so glad you liked it! Amazing. My finiky eaters tore it up. You are my hero. For a family of 6 I just used 3 large boneless skinnless chicken breasts, and 1 packet onion soup mix, and the 1 small can of mushroom soup. Turned out perfect and just added can goods as sides made a fabulous dinner. Thank you. I only have a 10 and a half oz can of cream of chicken. Do you think that would work or would it lose the gravy consistency? I also have multiple cans of beef gravy that could be used. What do you think? I think that would be enough cream of chicken! Can you use I can cream of .mushroom and I can cream of chicken and dry onion soup mix. usually it’s just half as much time on high. What if you are using Bone In chicken thighs? It would work great. Just remove skin and cut off excess fat before adding them to the slow cooker. Cook on low for 6 hours. Making this now….fingers crossed! Thanks for recipe. Thank you for this recipe. I put a sliced onion on the bottom, 4 frozen thighs (with bones and skin) on top, and then put two cans (10 oz) of cream of mushroom and a packet of dry onion soup mix on top. Finally, I had about a cup of chicken stock that I poured over and put the whole thing on low. I’m hopeful it will be saucy; not soupy. I’m looking forward to this dish! Can I used frozen breasts? If so, what should I change the cook time to? Can’t wait to try it! Sure thing. Just add a couple of hours to the cooking time. What are the nutritional facts for this meal? What happens is the can of cream of mushroom soup is just 10 3/4 ounces and not 13.75 ounces as in the recipe? Add water? no, don’t worry about it. It should be fine with just the smaller can! yep! They cook a bit quicker though. Well that sounds amazing! I hope you like it. can I use cream of chicken instead of mushroom soup. Yes! I think that would work nicely. Trying this today. I added chili powder and Italian seasoning. Fingers crossed! I'm excited to try this tonight with so many good reviews! The only things I would change is mix the cream of mushroom soup and the onion soup mix first and then pour that on top on the chicken. Also, I didn't have chicken thighs so I'm using boneless chicken breasts. Just made this tonight, my sisters licked their plates clean and went back for seconds!!!! Tasted amazing! Sara, so glad it worked out for you!! Just made this last night for my inlaws. They were coming in town and I wanted a hot meal ready for them when they got to their "Texas" home. I set up the crockpot and left. They absolutely loved it! I changed a few things based on what I had in the pantry & wanting to increase the amount of gravy. I used 8 boneless thighs, 2 packets of lipton mushroom onion soup mix, 2 cans healthy request cream of mushroom soup. I also cooked it on high. Hi Karen, I accidentally used too small of a can of mushroom soup, HELP!!! very excited to eat this though! any substitution if you dont like mushrooms or onions? just to have chicken, white kind of gravy and rice? Do you add any water to the cream of mushroom soup?